Grease a muffin tin with coconut oil. In a large bowl, combine flour, baking powder, baking soda, cinnamon, salt, vanilla powder, coconut sugar and mix well. Add eggs, olive oil, lemon extract and whisk well. Mash in bananas and mix thoroughly. 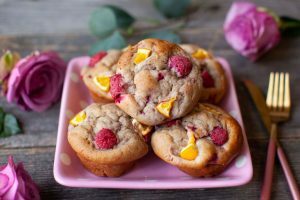 Add mixture to muffin tin and top with additional raspberries and lemon slices. Bake for 25-28 minutes or until a toothpick comes out clean. Cool on a cooling wrack. Enjoy! Makes about 12-15 muffins.